Chancellor Dan Rahn, M.D., and Robert Hopkins Jr., M.D., have been awarded Mastership in the American College of Physicians, the national organization of internists. 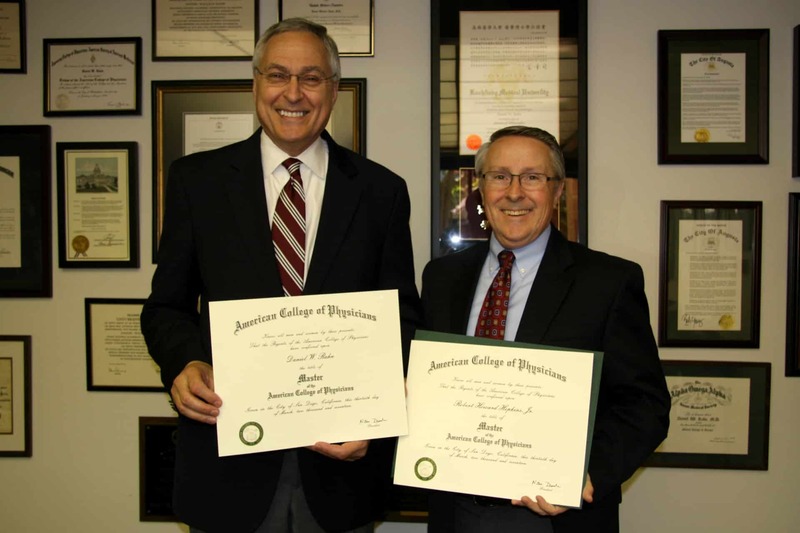 April 11, 2017 | April 11, 2017 | University of Arkansas for Medical Sciences (UAMS) Chancellor Dan Rahn, M.D., and Robert Hopkins Jr., M.D., professor in the UAMS College of Medicine have joined an elite group of physicians awarded Mastership in the American College of Physicians (ACP), the national organization of internists. Rahn and Hopkins, director of the Division of Internal Medicine in the college’s Department of Internal Medicine, were two of 53 internists from across the world to receive the honor at the ACP’s annual scientific conference, the Internal Medicine Meeting, held March 30-April 1 in San Diego. They were the only two Arkansans to achieve Mastership this year. The last Arkansan to be honored was in 2012. Only about 850 internists, or just more than .5 percent, of 148,000 ACP members worldwide have been awarded Mastership in the College. A native of Stroudsburg, Pennsylvania, Rahn is a graduate of Yale University and the Yale University School of Medicine. After completing internal medicine and rheumatology training at Yale, he entered the private practice of internal medicine and rheumatology. He later returned to the full-time faculty at Yale, where he was director of the Lyme Disease Program, director of clinical training in rheumatology and director of faculty practice for the Department of Internal Medicine. He is a member of the Association of Academic Health Centers and led its national Health Workforce Shortages Advisory Committee. His work involves developing strategies to address a wide range of population health and health policy issues. He has authored many scientific articles and textbook chapters. The American College of Physicians is the largest medical specialty organization in the United States. ACP members include 148,000 internal medicine physicians (internists), related subspecialists and medical students.